It is not always easy to find our niche, or readers who will become rabid fans, but since making the transition from writing for small publishers to going indie, I've put together a list of the ten important things I've learned on my journey. Hone language skills. Anybody can write a book, but attempting to do this without a good grasp of the English Language is setting ourselves up for failure. Learn the craft of writing. This is the biggest favour we can do ourselves. A period of apprenticeship is necessary no matter how we slice it. Don't get in a hurry to publish. Just as traditional publishers take time to prepare a book for publication, so should we. Virtual bookshelves mean our books will be available for a lot longer than a 3-month sales window. I've set unrealistic deadlines that resulted in mistakes I could have avoided. Treat writing as a business. While some of us may never make a living exclusively from writing, it is necessary to set goals and make plans. As the adage says, those who fail to plan, plan to fail. Never stop learning. It is important to stay current on publishing trends, as well as book marketing and promotion. Frustration with going back and forth forced me to learn how to format eBooks. 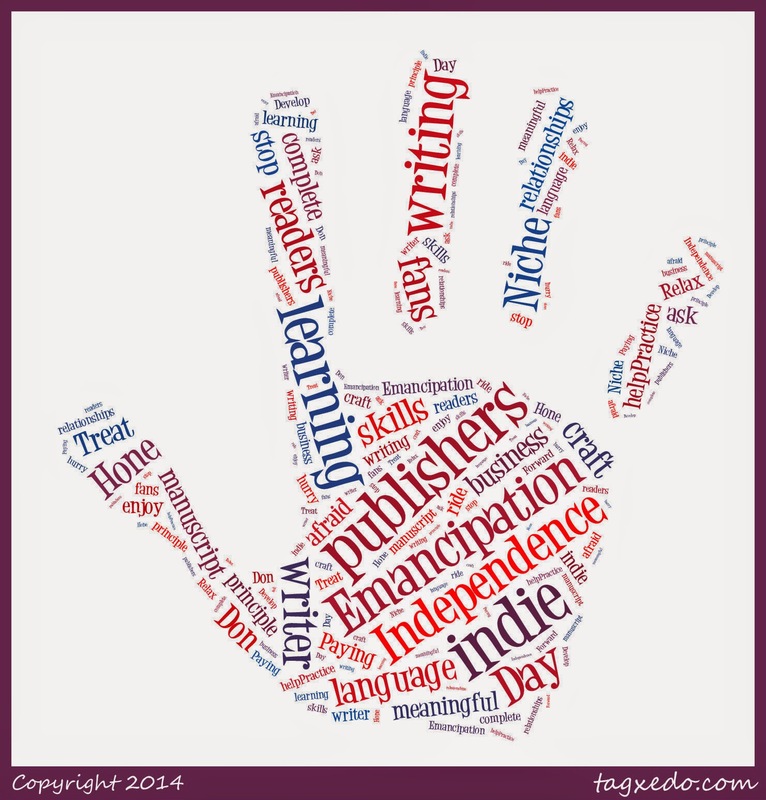 Continue reading craft articles and books on writing. A manuscript is never complete. We'll never cross every t’ and dot every ‘i’, but we should submit the best possible manuscript every time. Smart writers know how to let go and move on to the next book. Develop meaningful relationships. Most of my online friendships have come through writing networks, hops, challenges and visiting other people’s blogs. These friendships extend to email exchanges off the blog and even Skype calls. Never be afraid to ask for help. Writers are open and giving. I've never put out a cry for help and not received it. Practice the principle of Paying it Forward. The blogging world has taught me the value of helping other writers. Unexpected benefits come through the kindness of other bloggers. Relax and enjoy the ride. While it's important to be disciplined, remember there is life outside of what we do to earn a living. Creativity is a funny thing. Writing loses its attractiveness for me when it starts to feel like work—even though I’m handling my writing as a business. The point is to find your rhythm and make it work for you. What things have you discovered on your journey? This is a quick reminder that that Wednesday is post day for the group. If you haven't signed up, please do so here. Meaningful relationships and paying it forward - very important. Great tips, Joy. Excellent advice, Joy. I certainly couldn't have gotten Anansi published without the help of a lot of people in the blogging community. Too many people rush into publishing. Taking time to do it right is important. Excellent tips, Joy, I remember when I was a young writer in such a great hurry to be published. It took me a little longer than most, but I'm so glad I used all your tips first. Thanks for a great post. What a great post. Paying it forward is very important and asking for help. The blogging community is so kind and helpful. Excellent advice. Point 3 is one I've blundered on. Great advice. I so agree that writing can start to be no fun when it feels like hard work. I try to treat it like a business and not take rejections and other set backs personally. Since I'm about to publish my first novel, after lots of input from friends and readers, this is very good advise. I just need to press the "go" button and get this out there. Thanks so much. Thanks so much for sharing your thoughts on these tips, guys. I know we all go through these things in one form or another. We grow at our pace, so it is important to work at the speed where we're comfortable. Marvelous post! The biggest thing I've learned is don't be afraid to ask for help. The writing community is wonderfully generous in advice and encouragement. Great reminders I need to revisit on occasion. Especially the "don't rush" point. Thanks. Very helpful tips for writers no matter what avenue they pick to publish. Glad you found this post relevant, guys. I remind myself these things when I get in a funk.